Mar 1, 2018 – The American Museum of Natural History (AMNH) in New York will kick off its upcoming “Unseen Oceans” exhibit with a program featuring two of MBARI’s newest researchers—Kelly Benoit-Bird and Kakani Katija. The “Unseen Oceans” exhibit features MBARI video of deep-sea animals as well as displays that highlight Benoit-Bird’s and Katija’s research. 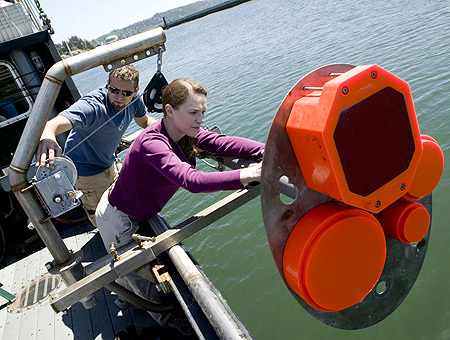 Benoit-Bird joined MBARI in 2016 and uses specialized sonar to study the schooling behavior of small animals such as anchovies, as well as the foraging behavior of larger marine predators such as dolphins and seabirds. She has pioneered the use of sonar devices on underwater robots that dive deep below the surface to get extremely detailed views of predator-prey interactions in the wild. 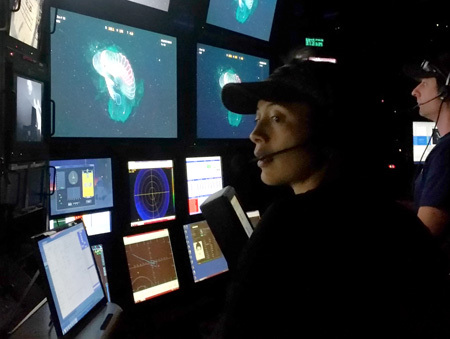 After working as a postdoctoral fellow at MBARI, Katija was hired in 2017 as a Principal Engineer. Her research includes developing tracking tags for gelatinous animals and building laser systems that show water flow around and even inside of marine animals ranging from jellyfish to sponges. Feb 28, 2018 – Two of MBARI's newer researchers—Kelly Benoit-Bird and Kakani Katija—are being featured in a program at the American Museum of Natural History.